We here at Esports-betting Pro found the best IEM Katowice 2019 bookmakers and odds. You will also be able to read our IEM Katowice 2019 betting tips and predictions once the tournament starts. BUFF.bet hooked us up with a special deposit bonus for the upcoming IEM Katowice 2019 CS:GO Major. If you use code: CSKATOWICE, BUFF.bet will double your deposit up to €88. Just like in every other tournament, there is one big favorite, that being Astralis. The reigning kings have been dominating the entire CSGO professional scene throughout the entire 2018. However, they did have a bad start to 2019. They were defeat by Liquid in the iBUYPOWER Master IV grand finals. When it comes to IEM Katowice 2019 betting tips, I would strongly advise you not to bet on Astralis to win the entire thing. All the best CSGO teams will attend IEM Katowice 2019, and who knows how will iBUYPOWER Master IV defeat affect Astralis. Furthermore, all Esports bookmakers are offering low odds on Astralis to lift the trophy, and current odds are not worth your money. Best IEM Katowice 2019 bookmakers? Since this is the biggest CSGO event of the year, every Esports bookmaker is turning their focus towards it. You can also expect ridiculous odds on some matches since every IEM Katowice 2019 bookmaker will want to stay ahead of the competition. Betting Odds presented by bet365. The listed odds are intended as a guide only and are subject to change. Please check current CS:GO odds on the bet365 website before placing any bets. Read more about esports betting at Bet365. 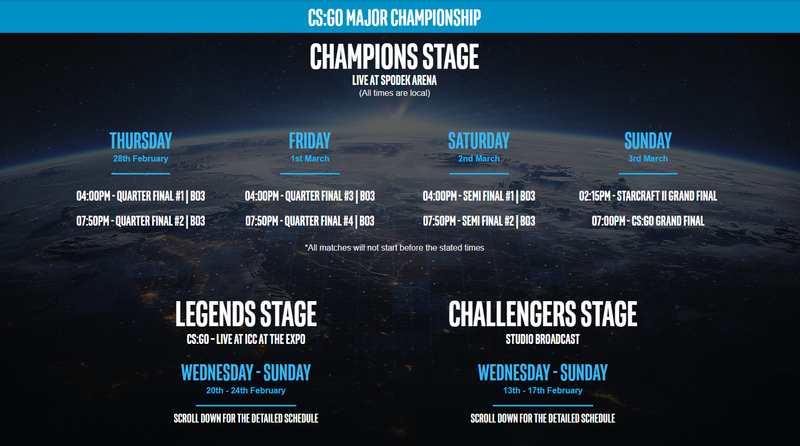 There are three stages to IEM Katowice 2019. Even though these stages seem complicated, trust me they are not. Another thing you need to know is that there is only one group in this event. Furthermore, two of these stages are considered as groups, while the final stage is also known as the playoffs. Let’s look at this Stage as the qualifier. Basically, 16 teams that were able to qualify through Asia, Europe, CIS, and Americas Minors are in this bracket. Furthermore, there are 2 teams that took advantage of their last chance to qualify for IEM Katowice 2019 throughout Minor Play-In. Lastly, 6 teams that earned their invite because of their placement in the FACEIT Major 2018. Another very important thing is that only the top 8 teams from The New Challenger Stage will advance through to the The New Legends Stage of the event. Just like we mentioned above, 8 teams that are going to the top Swiss group will advance through to this stage. However, 8 other teams are already waiting for them in The New Legends Stage. These 8 teams all earned their invite because of their performance and placement on the FACEIT Major 2018. This is the Main Stage of this event, and only the best 8 teams will advance through to The New Champions Stage. However, competition is going to be fierce in this one, and I can not wait to see what will certain teams bring to the table. This Stage is also known as the playoffs. Only the best teams on IEM Katowice 2019 will advance through to this stage. To be more precise, only the top 8 teams will compete in The New Champions Stage. Furthermore, there are no second chances for anyone in this stage. If you lose a game, you are out. First two stages will use the same format, while the third one will be a bit different. Let’s start with seeding. We have not seen Player-selected seeding for a while now. It was first implemented on IEM Chicago. In my personal opinion, this is the best seeding method, and I will explain why. Firstly you need to understand what we are talking about. Player-selected seeding is a seeding method where each player will rank the teams that are playing in the event. Once all the papers have been submitted, hosts will calculate the results and we will have a seeding which is relevant to the teams participating in the event. This method is as simple as it can be. IEM Katowice 2019 will start with best-of-1 matches. However, elimination and advancement matches will be played in a best-of-3 series. As mentioned above, the top 8 teams will advance through, while the bottom 8 teams will be eliminated from IEM Katowice 2019. This format applies to both The New Challengers Stage and The New Legends Stage. When it comes to The New Champions Stage, the format is fairly simple. All of the matches are played in a best-of-3 series and there are no second chances for anyone. If you lose one best-of-3 series, you are out. As we mentioned above, a total of 24 teams will fight for their share of $1.000,000 prize pool. However, not all of these teams will advance through to The New Legends stage of IEM Katowice 2019. We will start with The New Challenger teams. NRG is an up and coming CSGO team from North America. They had a good spell of results in late 2018, but they have been on a decline as of late. However, they are coming to this event as one of the favorites to advance through to The New Legends Stage. In my personal opinion, betting on NRG is probably a smart idea, but it is not going to yield you a lot of profit. FURIA is a Brazilian CSGO team that showed up out of nowhere. All of a sudden they have beaten teams like Envy, eUnited and Heroic. This is definitely going to be a huge challenge for this team, and it is going to be interesting to see how will they adapt to the pressure and the big stage. When it comes to IEM Katowice 2019 betting, FURIA could be darkhorse. They are capable of beating anyone. However, if they start feeling the pressure, they will crumble. At the moment, betting odds on FURIA to advance through this Stage is at whopping 1.50. Renegades is an Australian roster that has been a part of every Major so far. Even though they are eliminated in the early stages, they put up a good fight against anyone. This time around, they are coming to this event with a fresh roster based around their core players. Furthermore, Renegades have a very solid AWPer this time, and in my personal opinion, they could easily best the competition in The New Challengers Stage of IEM Katowice 2019. When it comes to betting, Renegades will most likely always be an underdog, and you bettors should take advantage of that since they are definitely here to play. Grayhound is another CSGO organization based in Australia. They were always standing toe-to-toe with Renegades. These two teams even competed on Asia Minor, where Renegades got the better of Grayhound. However, Grayhound was able to qualify despite losing to Renegades. To be honest, I do not rate them high at all. Even though they have decent individuals, I do not think that they are a team capable of advancing through to The New Legends Stage. If you are to bet against Grayhound on IEM Katowice 2019, you will, most likely, earn some money. AVANGAR is a Kazakhstan based CSGO roster that showed glimpses of perfection. They are mostly propelled by their star player and AWPer, Ali “Jame” Djami. To put it simply, this guy is a beast, and once he gets going, there is no stopping him. However, AVANGAR thrives once they are able to implement their play style into the game. They are a well-structured team who can dominate anyone, and they have proven that in the past. They also have a lot of experience on the big stage, and there is no way that they will feel any pressure. AVANGAR is my favorite to advance through to the next Stage. Spirit is a Russian organization filled with experience. It feels like some of their players have been on the big stage forever. However, they have also attracted some of the best young talents from the CIS region, and it is going to be interesting to see if they will be able to qualify. From the betting perspective, stay away from betting against Spirit, since you may never know when will someone pull off something crazy and carry the game himself. Once again, the safest betting tip that I can give you is to skip their matches. ENCE has been on a terror lately. They dominated everyone in crowded Europe Minor. They had no problems against the teams like North and Vitality, and that says a lot about them. ENCE is led by a CSGO veteran, Aleksi “allu” Jalli. Furthermore, they have two very young talents on their roster, who will soon be among the 10 best players in the world. ENCE is my second favorite to advance through to The New Legends Stage. This team is just too good to skip, and trust me, betting on them is definitely worth your money. Vitality is another up and coming CSGO roster in The New Challengers Stage. Just like ENCE, Vitality has been dominating the scene. They have also won WePlay!Lock and Load event not nearly a week ago. They had a great showing there, and in my personal opinion, they will still be on fire on IEM Katowice 2019. Vitality also has one of the best young prospects in the world, Mathieu “ZywOo” Herbaut. Even though you will not get high odds on Vitality, you should definitely take them, as they are definitely advancing through the group. Cloud9 has been among the best teams for a while now. Furthermore, they were able to win one Major in 2018. Sadly, they are on a decline, and they can not find a permanent fifth for their roster. However, they are here on a mission, and I believe that they have skilled individuals on their team. Hopefully, they will be able to advance through to The New Legends Stage, as it would be nice to see Major winners on the big stage once again. G2 is another legendary team. However, they were not able to find their rhythm throughout the entire 2018. They even made a couple of roster changes, but it did not help much. You should never write them off since they still have one of the best AWPers in the world, Kenny “kennyS” Schrub. Even though they will have a hard time against some of the teams here, they could actually advance through to the next Stage. Nip, just like G2 is a legendary CSGO team. They are housing two Counter-Strike legends, Christopher “GeT_RiGhT” Alesund and Patrik “f0rest” Lindberg. Furthermore, they have a solid team, but it feels like once they are in a slump, they have a hard coming out of it. NiP has incredibly skilled players on their roster, and it would a shame if they are not able to advance through to The New Legends Stage. From the betting perspective, you will not get a lot of value if you are to bet on NiP, and in my opinion, you should skip betting on NiP. TyLoo is a Chinese CSGO organization that has been attending Majors for a while now. To be honest, the only reason that they are here is that they have no competition in the Asian region. Even though they are housing one of the best individuals on the scene, Hansel “BnTeT” Ferdinand, it is simply not enough. My prediction is that TyLoo will not advance through this Stage. Even if they do, it is going to be very tense for them. Vega Squadron is a Russian CSGO team that made a name for themselves with the crazy strategies they use. Even though it worked for them in the last Major, I think that they will regret it if they are to use those strategies again. Probably, every other CSGO team in this Stage is going to be prepared for them. I do not fancy their chances at all, and I would suggest betting against them. Fnatic is another Swedish team that has been dominating the scene. However, in the last couple of years, they have been struggling, and it seems like they are not able to find a stable roster for themselves. However, they have been playing with the current roster for a while now, and I finally think that they will perform above other teams in this Stage. Even though they will probably advance through to The New Challengers Stage, I do not think that they will be able to compete against the likes of Astralis, Liquid, MIBR and FaZe. Winstrike is a team that simply ended up on IEM Katowice 2019. Even though the competition on the CIS Minor was strong, that did not stop these guys from qualifying. Furthermore, they were even able to best AVANGAR in the best-of-3 series, so do not be surprised if they are able to beat some teams here. Even though IEM Katowice 2019 bookmakers are not favoring them at all, they might prove wrong to a lot of people. ViCi is another stray bullet in the weak Asia region. They were able to qualify through the Minor Play-In and that says a lot about them. If they were not able to qualify through Asia Minor, they are weak. It is as simple as that. They are lacking in every department. Their individuals are not skilled enough, they do not have a strategy. ViCi’s entire game is based on winning individual duels, and that is not going to happen here. In my books, ViCi is going to win a single map here on IEM Katowice 2019. There are only 8 teams in this Stage at the moment, but they will find out who will they face off against relatively soon. We are also going to breakdown these 8 teams for you CSGO bettors and enthusiasts. Astralis is definitely the best team in this event. They terrorized everyone throughout the entire 2018. However, they did have a bad start in 2019, as they were eliminated by Liquid in the iBUYPOWER Master IV. They will definitely want to bounce back strong and win the first Major of the year. From the betting perspective, betting on Astralis would now yield you much profit, and the odds are ridiculous. You can understand that all the teams will be fired up against them, and I can see them lose some matches. BIG is coming off from roster changes. Their AWPer decided to leave them not even a week ago. However, they brought in one of the best riflers in the world. I do not fancy them at on IEM Katowice 2019, and I think that they will struggle against stronger teams. FaZe is also coming off fresh changes. They decided to assign the in-game leading role to their best player Nikola “NiKo” Kovač. Furthermore, they replaced their former in-game leader with another rifler, and it is going to be interesting to see how good will FaZe perform on IEM Katowice 2019. Since this is a team filled with superstars, betting on them is usually a great idea, if the odds are good enough. HellRaisers is another up and coming team on this event. Even though they have been poor in their recent showings, they are definitely capable to win against stronger teams. Furthermore, if their deadly duo of Özgür “woxic” Eker and Issa “ISSAA” Murad is on point, you can expect great things from these guys. They are definitely darkhorse in this event, and you should definitely keep an eye on them. Liquid is coming to IEM Katowice 2019 with one wish, to lift the trophy. There is a reason why they are the second favorites to win the entire thing. Liquid is coming off from a successful run on iBUYPOWER Masters IV. They are a well-rounded team, and their latest addition has proven to be the missing piece of the puzzle for them. Lastly, odds on Liquid to win IEM Katowice 2019 are really high, and this bet definitely has value. MIBR is just like many other teams on this event, coming off from fresh roster changes. This former SK roster decided to revert back to the full Brazilan roster. Furthermore, they even brought back their former coach, zews. At the moment, things are looking good for MIBR, and odds are so juicy. Future is definitely bright for MIBR. Natus Vincere is another potential darkhorse in this one. You can never know with Oleksandr “s1mple” Kostyliev. This guy can with the entire tournament by himself. If he starts feeling it, its over. There is no stopping him once he gets going. However, he is surrounded by veterans who are not able to carry their own weight. This is the main reason why I believe that Natus Vincere will not be able to do much in this event. compLexity is an American CSGO organization that was very successful in their last Major. That is the main reason why they are in The New Legends Stage. However, I do not think that they will win a single match on this Stage, and they could be the first team to be eliminated from The New Legends Stage. As mentioned above, a total of $1.000,000 has been added to the prize pool. Below you will be able to find all of the first match-ups and the complete prize pool breakdown. Who is your favorite to advance through to The New Legends Stage and why? Do you agree with our IEM Katowice 2019 predictions for the first Stage of this event? Be sure to let us know your thoughts in the comments down below.